Fits waists that measure from 38" to 42"
The ultimate hybrid of safety, support and comfort, this ProFlex High-performance Back Support helps you win your workday tug of war and reduce the risk of back injuries. Nonconductive, patented Sticky Fingers Stays deliver firm and continuous lower back support and offer the greater durability and gripping properties than industry-standard rubber track tape. Power Panel Positioners keep power panels in place so they are accessible when needed for improved functionality and compliance. 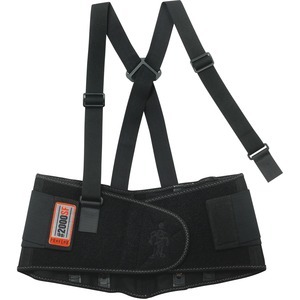 Innovative V-shape and adjustable, detachable suspenders allow a better fit. Design also features spandex body material and stretchable bias binding with zigzag stitching. Back support is great in material handling, construction, warehouse/distribution, maintenance, freight/baggage, assembly/fabrication and landscaping/grounds. The X-large size fits waists that measure from 38"" to 42"". Waist Size 38" - 42"